This volume provides an in-depth analysis of Cisco LAN switching technologies, architectures, and deployments, including unique coverage of Catalyst network design essentials. Network designs and configuration examples are incorporated throughout to demonstrate the principles and enable easy translation of the material into practice in production networks. Network engineers and managers can use these case studies, which highlight various network design goals, to explore issues including protocol choice, network stability, and growth. This book also includes theoretical discussion on advanced design topics. Network engineers can find solutions as their IP networks grow in size and complexity. Examine all the major IP protocols in-depth and learn about scalability, migration planning, network management, and security for large-scale networks. This book takes the reader from a basic understanding of routers and routing protocols through a detailed examination of each of the IP interior routing protocols. Learn techniques for designing networks that maximize the efficiency of the protocol being used. 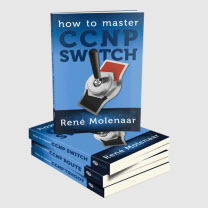 Exercises and review questions provide core study for the CCIE Routing and Switching exam.